posted March 01, 2015 09:00 PM bonus applied by OmegaDestroyer on 09 Mar 2016. Edited by Minastir at 19:12, 04 Apr 2015. Polis is a faction similar to the HIII Conflux set in the world of Ashan. 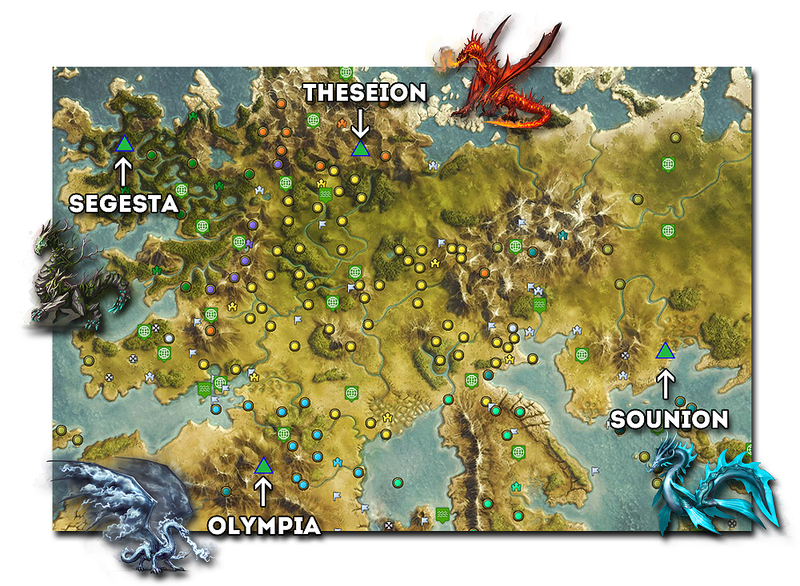 Just like every other faction in Ashan Polis has a certain theme, it is ancient greece. 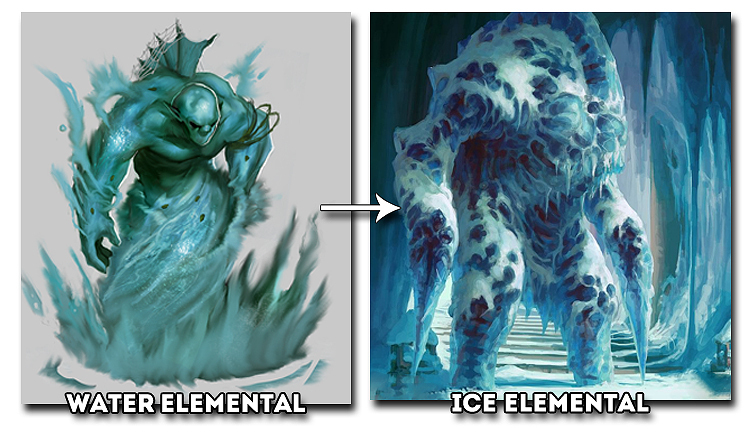 Yes, for elementals description i have used HVI elementals biography, since this faction would exist in Ashan, i thought there is no reason to rewrite that. Country/Kingdom: 4 cities - polis: Sounion, Theseion, Olympia, Segesta. In the Historical Age not every human tribe of the central plains of Thallan was happy that Ronan "the Great" was about to become the High King and their ruler. Those people didn't wanted to be ruled by anyone and that's why Four tribes united as one, to created their own faction. The people of those tribes were worshiping one of four dragon gods: Arkath, Shalassa, Sylanna and Ylath. Polites are peaceful and they do not like conflict and war. They are living very optimistic but also religious life and they didn't wanted to live in the Holy Empire. That's way they decided it would be safer for them to devide themselves in four groups, depending on which of the four gods they worship. They went in four directions, to the north, east, west and south. Because they were peaceful, great diplomats and neutral to the conflicts between factions elves, dwarves, nagas and wizards of the seven cities let them build 4 cities (Polis) on their territory. Polites after all were not indifferent to what was happening in the world and hardly anyone knows about it but it's not only because of the orcs that demons were banished to Sheogh. Nobody in the world knew about it, but they didn't needed the attention. To their surprise four dragon gods, grateful for their help in saving Ashan, gave them the power of the 4 elements and the ability to summon elementals. Sounion - (Shalassa) - Sounion sits on the coast, surrounded by rivers and vast, stepped grasslands. Fields of a cultivated type of barley called sitra provide sustenance to Sounion and their animals. Branches of the River Kheir splay out across the landscape, bringing fresh water and trade from distant villages. Theseion - (Arkath) - The mountain realms that surround the mighty polis of Theseion serve as shield between its holdings and the rest of Ashan. The central fortress is a huge, many-tiered structure perched on a cliff. 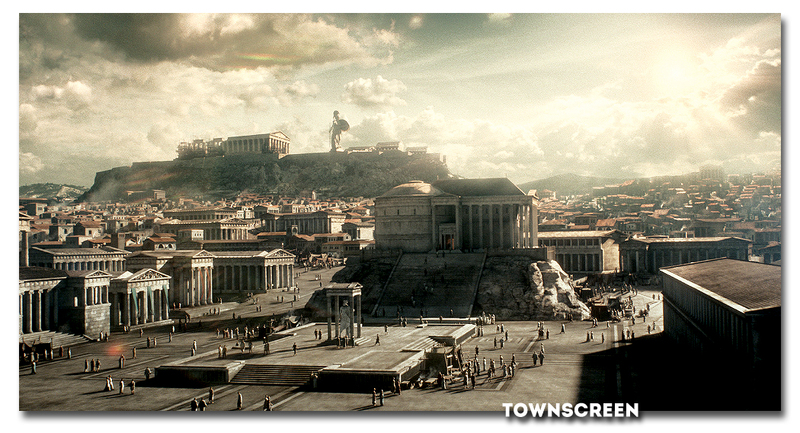 Within its thick stone walls the Theseion people worship, train, and conduct their lives. 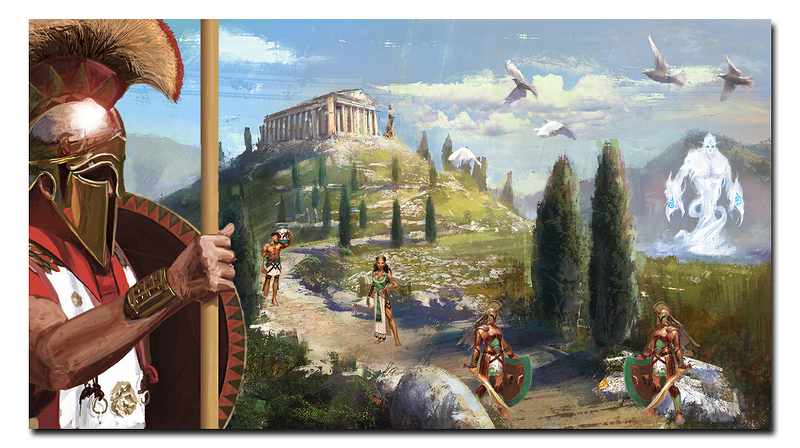 Olympia - (Ylath) - The polis Olympia is build on one of the highest peaks in the Ashan. At the top of the mountain there is a spring that supplies Olympia in water. The only way to the city is a narrow steep path on the mountainside but the people of Olympia usually fly on big caucasian eagles every where they want. Segesta - (Sylanna) - From a bird's-eye view, Segesta's layout resembles the rings of a tree, which radiate outward from the Temple of Sylanna at its heart. Swaths of forest alternate with family dwellings and other civic structures. Segesta's outermost ring is a dense circle of trees and vegetation that functions as a natural wall against outsiders. The trees have platforms for archers and the wall is constantly guarded. Grateful for the ability to summon elementals, polites worship four dragon gods, which represent four elements; Shalassa, Arkath, Ylath or Sylanna. Even tough you can find shrines for every dragon god in every polis, there is one big temple for every town. Dragon god not only represents which element the citizens specialize in but also represents the way they live their lives because they are their Patrons for example Sounions are very calm, gentle and empathic but on the other hand Segestians are determined, loud and they made decisions very quickly. there are quite few users of light magic but it's hard to find Polites who use dark and prime magic. The people of Polis knew that in order to remain one faction they needed a leader after all, but they wanted him/her to be elected by the council of the wisest of each city, philosophers. Once a year the council of 12 Philosophers from each city gathers to choose a consul whose responsibility is to protect the Polites, it's is a great honor and privilege. The council of 12 Philosophers: Polis is world renowned as the center of philosophical thought. Philosophers have special status there; they are often attended by servants so that they might spend more of their time debating, thinking, and teaching. The Twelve, a council of philosophers, serves as the ruling body of each polis. Anatolius, the wandering oracle: The wise and ancient sphinx Anatolius is not a consistent resident of Polis. Instead, he appears a few times a year during moments of historical import, such as religious ceremonies, coronations, and the onset of wars. Anatolius has been part of Polis history for many decades, seeming to possess cryptic knowledge of future events. His arrival is not necessarily seen as a good omen, as his predictions can be dire. 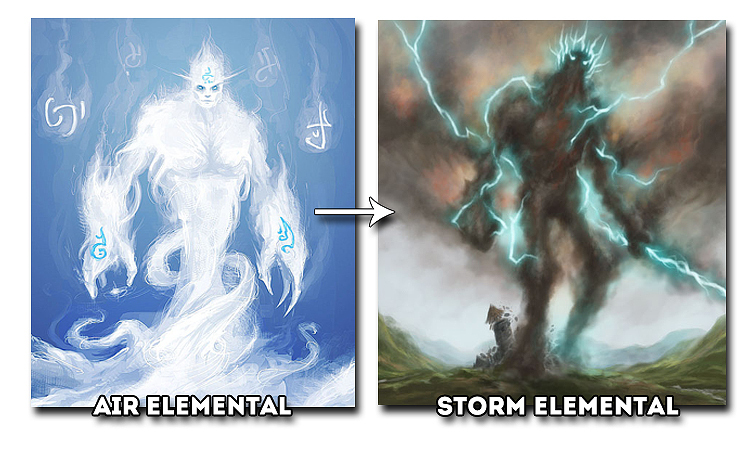 Elemental link - special faction ability, that allows a Hero to connect, create a special link with one of four elementals (water,air,fire and earth). During the battle Hero chooses one elemental and creates a link with it, this link increases Heroes power of spells based on particular school of magic, for instance a link with water elemental increases spell power of Water Magic and the higher amount of elementals the stronger the spell power. Fierce winds that follow the dragon-veins along deep chasms, the cliffs of high mountains, or wide-open plains can collect and carry powerful motes of elemental energy. These have been observed to condense and generate Air Elementals. Spontaneous appearances are also associated with the most violent storms, hurricanes, and tornadoes that lash the surface of Ashan. A rare variety of Air Elementals can also be born from the dying breath of high-ranking priests of Ylath, the Dragon-God of Air. These spirits are unusually potent, and generally viewed as lords among their kind. Chain Lightning - The Air Elemental's ranged attacks deals damage (Air) to the target stack and up to three extra enemy stacks. Damage is halved by each jump. Hoplites are citizen-soldiers of Polis who are primarily armed with spears and shields. Hoplites generally received basic military training. 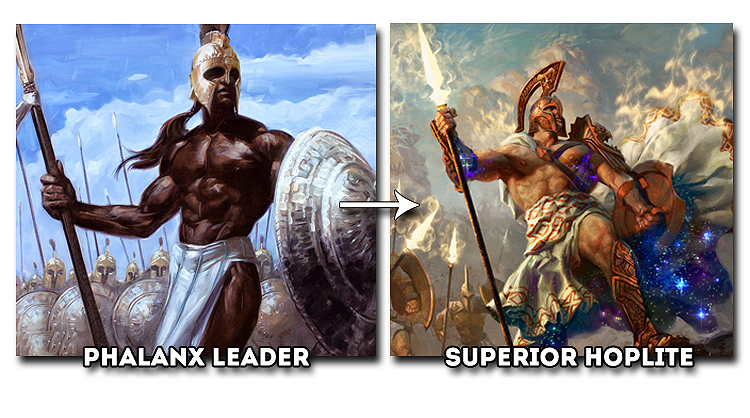 Phalanx Leaders are high ranking hoplites, who spur to fight other comrades and issue the command to create the phalanx. The hoplite phalanx of is a formation in which the hoplites would line up in ranks in close order. The hoplites would lock their shields together, and the first few ranks of soldiers would project their spears out over the first rank of shields. The phalanx therefore presented a shield wall and a mass of spear points to the enemy, making frontal assaults against it very difficult. Superior Hoplite is the one who showed courage and bravery in battle. Their fame and valor is comforting for companions. Phalanx formation - Creature receives only 50% of damage from all non-magical shooting attacks..
Shield Allies - All friendly creatures located on neighbouring tiles get only 50% of damage from non-magical shooting attacks. Phalanx formation - Creature receives only 50% of damage from all non-magical shooting attacks. Fighting Spirit-Each of the Superior Hoplite default attacks increases its Morale by 2, up to a maximum bonus of 30. Retaliation will not trigger this effect. This ability can not be dispelled. 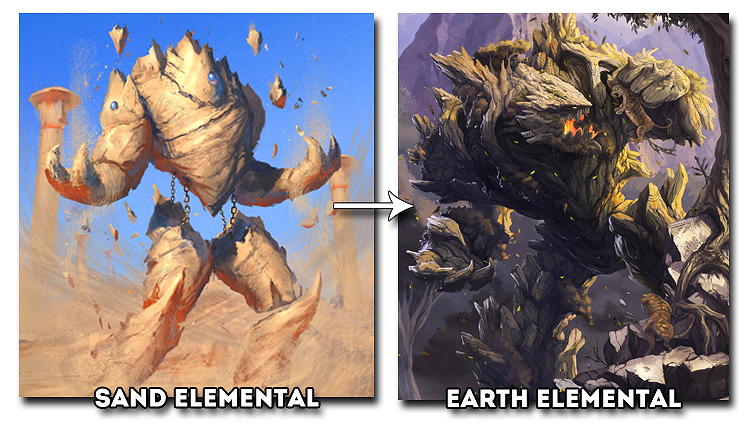 Earth Affinity - Elementals are dealt 50% reduced damage from their affinity element (Earth) and 50% increased damage for their counter-element (Air). Elementals are also immune to negative effects from their affinity element. Petrification - Target creature turns to stone and becomes invulnerable for +1 turns. Target enemies cannot act. Target friendly creatures may act but doing so will dispel this effect. Spirit of Courage/Victory are spirits of great Heroes which were killed too soon, assassinated or betrayed. They can't accept that fact that their body is no longer able to function while their spirit is still very strong and wants to fight with the enemy. The anger, the need to help others and sens of mission, causes those spirit to materialize in physical plane, often accompanied by a huge blinding flash. Now in their spirit form, made of pure light they are even stronger than during their life, usually wearing their old armour and using weapon from their "previous" life. 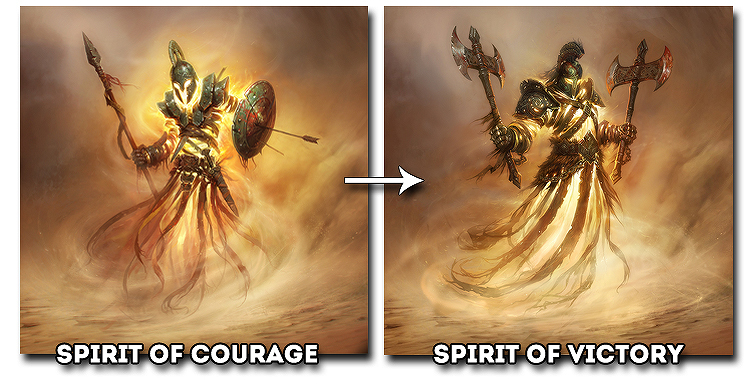 Sometimes Spirits of Courage/Victory are called Light Elementals. Second chance - Spirits of courage has been given second chance to fight with enemy, he is determined, immune to negative morale effects. For Victory - (Activated Ability, 3 times per battle) Spirit of Victory can cast a random Blessing at the selected friendly target, 3 times per battle. Water Affinity - Elementals are dealt 50% reduced damage from their affinity element (Water) and 50% increased damage for their counter-element (Fire). Elementals are also immune to negative effects from their affinity element. Liquid Body - Increases resistance to damage by 20%. Frozen Body - Increases resistance to damage by 30%. Archons are the descendants of one of the oldest families of Polis, trained from the very young age to become one of the most skilled warriors in the whole Ashan. Along the physical training they are contemplating in silence the learnings of one of the four gods. Archons soar on the backs of giant winged bulls, very old creatures which are considered almost sacred and that is why only archons have the honour to ride on them. 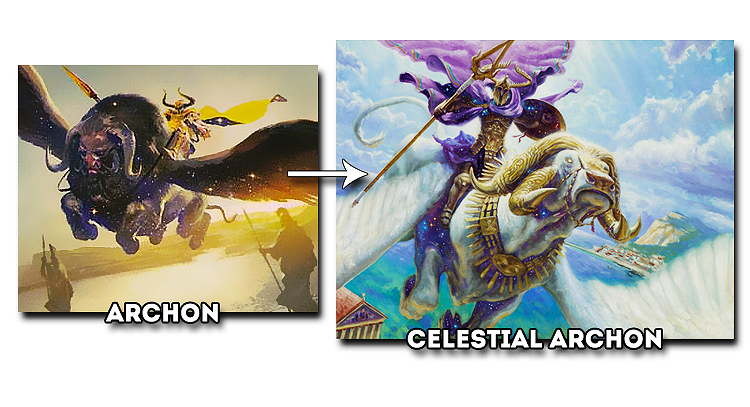 Through meditation, prayer, and by studying the teachings of four dragon gods, archons gain greater knowledge along with physical strength, through this process they are elevated to a higher level of being, almost celestial. Celestial Charge - Damage increases by 10% for each square crossed and the attacks cannot be retaliated. When the anger of Arkath, the Dragon-God of Fire, grows great enough that it breaks the barrier between the Elemental Plane of Fire and the world of Ashan, this rage can create a wave of elemental magic that generates rash and ill-tempered Fire Elementals. The intensity and cause of the fire determine to an extent the personality and power of the Elemental. Most are born from spontaneous forest fires, others from unusual flows of lava, or volcanic eruptions. Fire Elementals born deep in the bowels of Ashan, near the gates leading to Sheogh, are unstable and occasionally contaminated by the influence of Urgash, the Dragon of Chaos. A Fire Elemental can also rise up from the hearth of a household devoted to Arkath, or a sacred brazier lit by the prayers of a Dwarven Rune Priest. 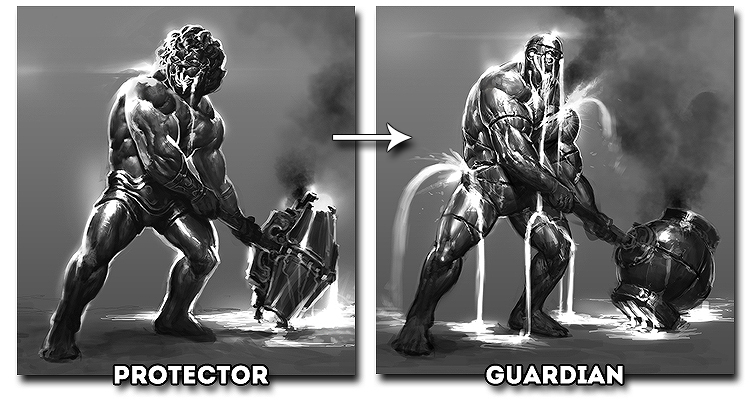 Dwarven smiths often summon Fire Elementals to help them in the forging of their legendary weapons and armour. Fire Affinity - Elementals are dealt 50% reduced damage from their affinity element (Fire) and 50% increased damage for their counter-element (Water). Elementals are also immune to negative effects from their affinity element. 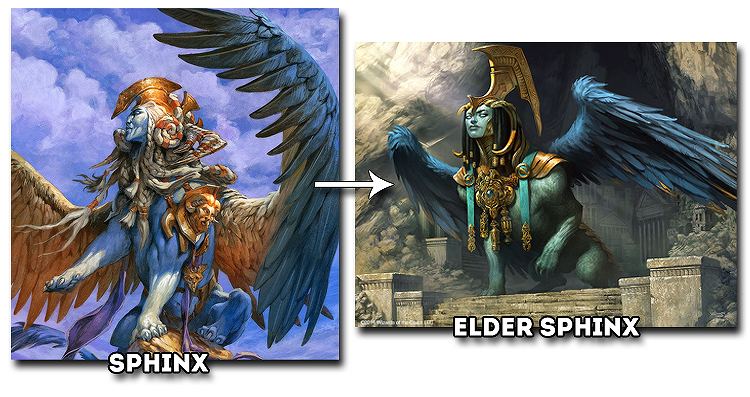 Sphinxes are large, powerful creatures with lion-like bodies, human faces, and feathered wings. In Ashan exist both male and female Sphinxes. Sphinxes are known for their cunning and vast intellect, great wisdom about the history of Ashan and even some can predict the near future (Anatolius, the wandering oracle) because of the ability the feel the disturbances in the worlds balance. Huge, strong wings and very sharp paws makes sphinx great predator and it means that Sphinxes are creatures for both might and magic Hero. Sharp Claws - Target is able to use only 70% of its defense when attacked by Sphinx. Extensive Knowledge - Sphinxes possess such vast knowledge that the Hero learns 1 random skills (level 1 or 2) for the time of the battle. Sharp Claws - Target is able to use only 60% of its defense when attacked by Elder Sphinx. Extensive Knowledge - Sphinxes possess such vast knowledge that the Hero learns 3 random skills (level 1 or 2) for the time of the battle. Wings blast (activated ability - available every 2 turns) - Sphinx can create strong air blast with their mighty wings damaging all sdjected creatures. One of the oldest, primordial creatures of Ashan. Embodiment of magic, the essence of which not many have heard of, let alone seen, only a handful have remained in this world. Elementalists use them in combat only in moments of greatest crisis because they are dangerous even for their master. No enemy retaliation: The mystical elemental can attack without fear of retaliation. No enemy retaliation: The magic elemental can attack without fear of retaliation. Firebird is a manifestation of pure fire freely roaming in the skies. These magnificent beasts are as quick as fire itself and immune to spells of the same nature. The essence of fire makes Phoenixes very hard to hit - any attacking creature will burn in their flames. 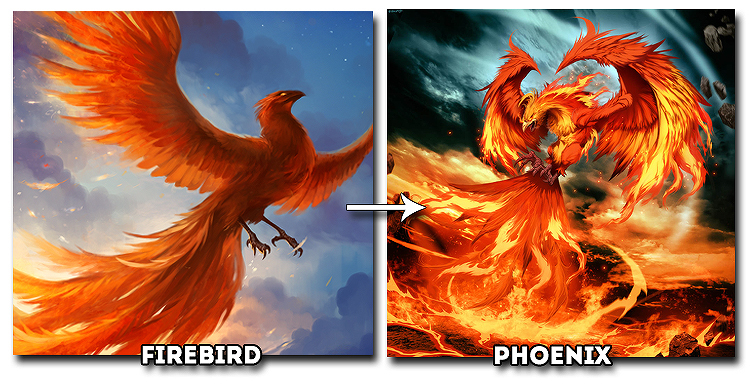 But the most amazing Phoenix ability is to rise anew from the ashes they burn down to after their death. Spirit Form - Spirits benefit from +50% resistance to all damage at the start of each combat. Lasts until an action was taken by the creature. Fire Affinity - Firebirds are dealt 50% reduced damage from their affinity element (Fire) and 50% increased damage for their counter-element (Water). Firebirds are also immune to negative effects from their affinity element. Breath attack: The phoenix's attack damages the unit behind the target as well. Fire Affinity - Phoenixes are dealt 50% reduced damage from their affinity element (Fire) and 50% increased damage for their counter-element (Water). Phoenixes are also immune to negative effects from their affinity element. Aura of living Fire - Enemy creatures attacking or being attacked by the Phoenix are dealt 30 fire damage. This damage cannot be healed. 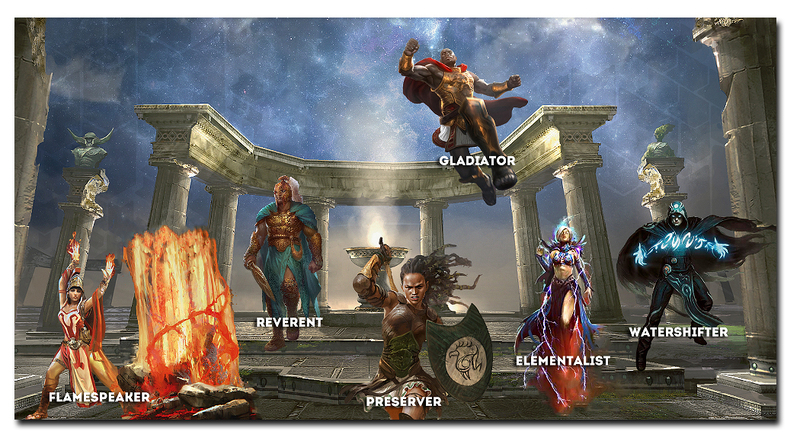 A artificial creation of Elementalists, this is what happens when you fuse together one elemental of each of element: Air, Earth, Fire, and Water .They are often bound to a specific location to serve as protectors. They look like a humanoid constructs of the four elements that compose them, creating them requires a lot of wisdom, skills and resources. Earthquake - Deals 4 structural damage to walls and obstacles in the target 4x4 area. All creatures caught within the area will also be "Dazed". Instead of Tessera, i would recommend "Polis" as the Faction name. changed, Thanks for all your help !! Edited by Galaad at 23:31, 01 Mar 2015. Wow Minastir, Conflux is not my favorite H3 faction but the lineup/choice of creatures is awesome! What did Téssera originally means? If he focus on 2 elements then it wouldn't be a Conflux town but more of a Heroes VI themed town that had one variation of an elemental unit. 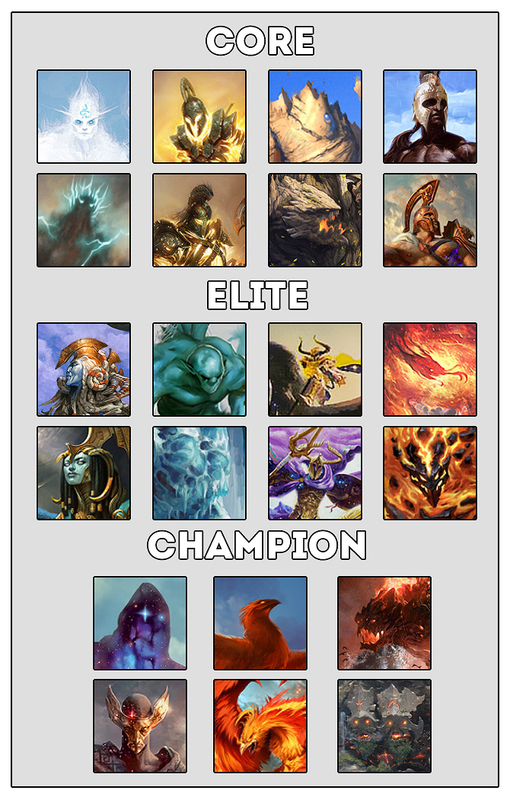 Since the theme is the Conflux of Heroes 3, the elementals should stay, but they don't need to be in their pure Form. For example, he could use Sylphs, gnomes, salamanders and Undines. But i think the primal forms of lesser Elementals are better. If there were more Greek units, the Town would look more like Haven than Conflux. After all the greek units are mostly the flavor instead of the main troops. That's why they are the "elites" or "superiors" of their company. Finally, and this is my own observation to Mike, since the Town is meant to be in the Ashan world, maybe chance the Archon name, since Archons are in Necropolis. and about 100% magic immunity to all magic i have also thought but wouldn't it be too powerful compared to other Ashan Champions ? ok but what would be better, and ideas ? In Ashan there are not that many references to greek culture and architecture so why not make use of it? It is core of fantasy games, it deserves it! And it is cool! Earlier Academy had many greek elements, same warlock, now they are gone... I think adding very greek faction is too great too miss it, it would vary and difffer them quite well and give proper mentality! Another Conflux faction! One big and fat LIKE! Nice job! Edited by Jiriki9 at 09:58, 03 Mar 2015. EDIT: also, I sadly gogt no time for further questions and such right now but they will probably come. Hm, Minastir, I was looking at some rules in proposing these factions, but couldn't find anything regarding that we should post units broken down in Core, Elite and Champion. Can we have other layouts then? Edited by Jiriki9 at 13:25, 05 Mar 2015. @Minastir: I do understand your point, and the limit is new anyway, but it was decided before the contest and I think it would be unfair to remove the restriction now, with the end of the contest less than a month away.